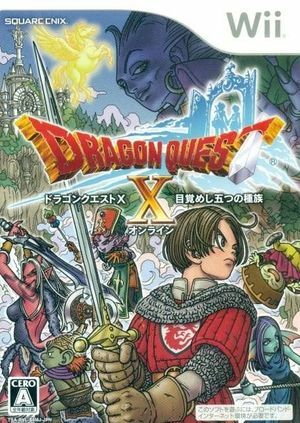 Dragon Quest X: Mezameshi Itsutsu no Shuzoku Online is a massively multiplayer online role playing game taking place in a world known as Astordia. Create a character and select multiple classes and five races: Dwarves, Ogres, Elves, fish-like Wedi and petite Pukuripo; each with their own continent and stories. Quest alone or in a party of up to four. Enemies roam the overworld and battles begin upon contact. Combat is menu based, with waiting times between each move, and players can move around the battle area as they please. This title comes on two discs. Both are required to install the game data to a USB mass storage device. On top of having two Wii discs, Dragon Quest X: Mezameshi Itsutsu no Shuzoku Online has a huge install file that can increase in size with online updates and expansions. Up to 16GB of space within Dolphin's user folder may be used. Please be aware of this when attempting to play this game. When installation is complete, the Japanese Wii System Menu must be used in order to boot the channel. By moving the current Wii NAND root to a new folder, Dolphin can create a Japanese region Wii NAND complete with the Japanese System Menu. Booting the Wii System Menu option when that NAND is selected will launch the Japanese System Menu, and with Dragon Quest X installed, it will be bootable. When using online mode, the game will check for updates by connecting to the Wii Shop infrastructure. Because the shop servers will only give information about the Dragon Quest X update titles if and only if the console region is set to Japan and matches with the shop account region, a Wii Shop account with the region set to Japan is required. Failure to check for updates and update to the latest version will result in the Dragon Quest X server rejecting connection attempts immediately. When viewing the map, the game will crash if "Skip EFB Access from CPU" is unchecked. Until the cause is figured out, it's recommended to enable this hack to work-around the crash. Dolphin's IOS HLE is currently incomplete and does not have a full implementation of the WFS modules which are used by the game. It is unplayable as a result. As of Dolphin 5.0-1837 WFSI and WFSSRV have been implemented to the point where the discs can successfully install the channel. Unfortunately the channel still doesn't run due to other missing WFS functionality. 5.0-5167 adds the necessary function to get in-game. Additional information regarding installation can be found at PR #5930 until WFS support is more complete. The graph below charts the compatibility with Dragon Quest X: Mezameshi Itsutsu no Shuzoku Online since Dolphin's 2.0 release, listing revisions only where a compatibility change occurred.